Find the event calendar and support our advertisers by clicking below and reading the actual magazine! U Arts Reception with Lamborghini Prosecco and Champagne. Art and Cocktail mixer from 7-10 pm. National Hotel on South Beach. Free event. Italic Award Gala honoring Ugo Colombo & Peter Vittori. Penthouse at Riverside Wharf. Registration closed as of November 30th. 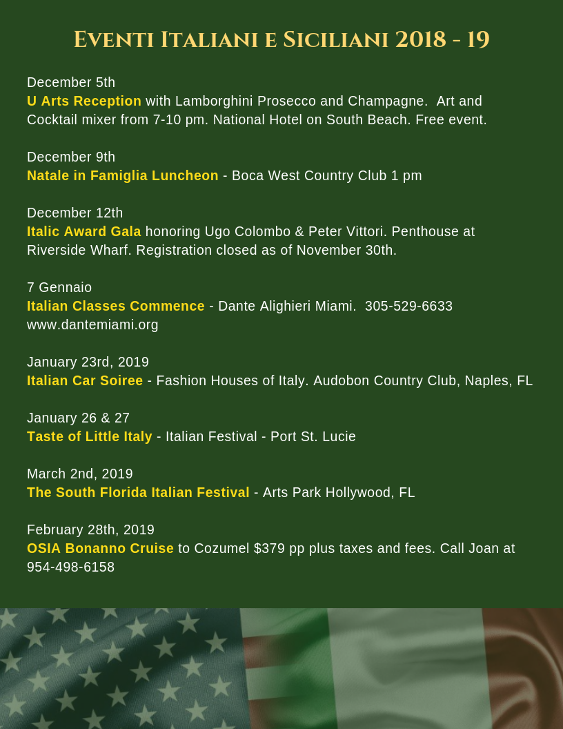 100 Year Anniversary of Italian Club of Tampa. Festa Italiana / Italian Heritage Day & Winefest of Italy. We've just launch a Youtube channel "Italia Canale - Italian Channel 4 Americans" so that we can share the events of our advertisers and sponsors for both pre-event marketing and post-event coverage reasons. Please take a moment to subscribe. The channel was launched in mid October 2018 and we do not have any subscribers yet but with your help we can grow it into a viable and productive entity.